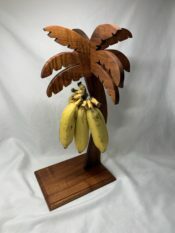 North Shore Koa Designs creates a wide range of items for your home. Computer assisted equipment is never used to make any item. Each item is handcrafted individually with Aloha. All fine sanding and finishes are done by hand. Custom orders are accepted, contingent upon the availability of Koa wood. All wood is purchased from local sources in Hawaii that harvest ethically and legally. North Shore Koa Designs take pride in creating beautiful pieces of Koa wood. Purchasing an item from this company brings Hawaiian tradition and culture to your home.